Katherine joined Levin Ginsburg as a Partner in May 2017. 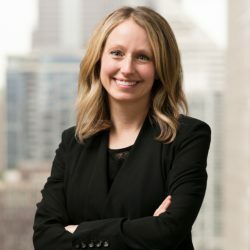 Katherine has over 16 years of experience in litigating complex business disputes at every stage in both state and federal courts. She has also briefed over 50 appeals in Illinois appellate courts, briefed and argued numerous dispositive motions, performed and supervised legal research, handled and supervised discovery and discovery-related motion practice, prepared numerous complaints and other pleadings, and participated in several trials and mediations. In addition to her litigation practice, Katherine often counsels clients on early resolutions and settlement strategy. Katherine represents both companies and individuals in a broad range of complex business litigation and appellate matters, including breach of contract disputes, fraud and breach of fiduciary duty claims, partnership, shareholder and membership disputes, insurance coverage matters, professional malpractice claims, real estate disputes, employment-related claims, antitrust claims, and veil-piercing and successor liability claims.